A service is an app component that performs long-running operations, usually in the background. Unlike an Activity, a service doesn&apos;t provide a user interface (UI). Services are defined by the Service class or one of its subclasses. A started service is a service that an app component starts by calling startService(). A bound service is a service that an app component binds to itself by calling bindService(). Use bound services for tasks that another app component interacts with to perform interprocess communication (IPC). For example, a bound service might handle network transactions, perform file I/O, play music, or interact with a database. A service runs in the main thread of its hosting process—the service doesn&apos;t create its own thread and doesn&apos;t run in a separate process unless you specify that it should. If your service is going to do any CPU-intensive work or blocking operations (such as MP3 playback or networking), create a new thread within the service to do that work. By using a separate thread, you reduce the risk of the user seeing "application not responding" (ANR) errors, and the app&apos;s main thread can remain dedicated to user interaction with your activities. In Android 8.0 (Oreo, API 26) or higher, the system imposes some new restrictions on running background services when the app itself isn&apos;t in the foreground. For details about these restrictions, see Background services and API 26. 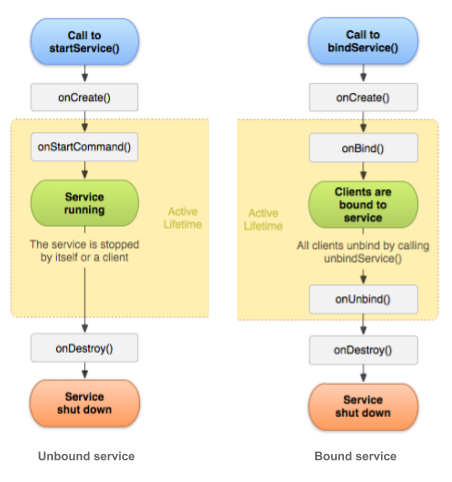 Extend a Service class such as IntentService and create implementation code, as described in Started services and Bound services, below. To block access to a service from other apps, declare the service as private. To do this, set the android:exported attribute to false. This stops other apps from starting your service, even when they use an explicit intent. An app component such as an Activity calls startService() and passes in an Intent. The Intent specifies the service and includes any data for the service to use. Note:IntentService is subject to the new restrictions on background services in Android 8.0 (API 26). For this reason, Android Support Library 26.0.0 introduces a new JobIntentService class, which provides the same functionality as IntentService but uses jobs instead of services when running on Android 8.0 or higher. * for the worker thread. * worker thread with the intent that started the service. A service is "bound" when an app component binds to it by calling bindService(). A bound service offers a client-server interface that allows components to interact with the service, send requests, and get results, sometimes using interprocess communication (IPC) to send and receive information across processes. A bound service runs only as long as another app component is bound to it. Multiple components can bind to the service at once, but when all of them unbind, the service is destroyed. To retrieve the IBinder interface, a client app component calls bindService(). Once the client receives the IBinder, the client interacts with the service through that interface. Caution: Do not use an implicit intent to bind to a service. Doing so is a security hazard, because you can&apos;t be certain what service will respond to your intent, and the user can&apos;t see which service starts. Beginning with Android 5.0 (API level 21), the system throws an exception if you call bindService() with an implicit Intent . The lifecycle of a service is simpler than the Activity lifecycle. However, it&apos;s even more important that you pay close attention to how your service is created and destroyed. Because a service has no UI, services can continue to run in the background with no way for the user to know, even if the user switches to another app. This situation can potentially consume resources and drain the device battery. // indicates how to behave if the service is killed. // interface for clients that bind. // The service is being created. // The service is starting, due to a call to startService(). // A client is binding to the service with bindService(). A bound service exists only to serve the app component that&apos;s bound to it, so when no more components are bound to the service, the system destroys it. Bound services don&apos;t need to be explicitly stopped the way started services do (using stopService() or stopSelf()). While most services run in the background, some run in the foreground. A foreground service is a service that the user is aware is running. Although both Activities and Services can be killed if the system is low on memory, a foreground service has priority over other resources. To request that a service run in the foreground, call startForeground() instead of startService(). This method takes two parameters: an integer that uniquely identifies the notification and the Notification object for the status bar notification. This notification is ongoing, meaning that it can&apos;t be dismissed. It stays in the status bar until the service is stopped or removed from the foreground. Note: The integer ID for the notification you give to startForeground() must not be 0. Services running in the background can consume device resources, potentially using device battery and resulting in a worse user experience. To mitigate this problem, the system now applies limitations on started services running in the background, beginning with Android version 8.0 (Oreo, API 26) or higher. These limitations don&apos;t affect foreground services or bound services. The startService() method now throws an IllegalStateException if an app targeting API 26 tries to use that method in a situation when it isn&apos;t permitted to create background services. The new startForegroundService() method starts a foreground service from an app component. The system allows apps to call this method even while the app is in the background. However, the app must call that service&apos;s startForeground() method within five seconds after the service is created. While an app is in the foreground, it can create and run both foreground and background services freely. When an app goes into the background, it has several minutes in which it is still allowed to create and use services. At the end of that time, the app is considered to be idle. The system stops the app&apos;s background services, just as if the app had called the services&apos; Service.stopSelf() methods. Android 8.0 and higher does not allow a background app to create a background service. Android 8.0 introduces the new method startForegroundService() to start a new service in the foreground. After the system has created the service, the app has five seconds to call the service&apos;s startForeground() method to show the new service&apos;s user-visible notification. If the app does not call startForeground() within the time limit, the system stops the service and declares the app to be ANR (Application Not Responding). For more information on these changes, see Background Execution Limits. For API level 21 and higher, you can launch services using the JobScheduler API, and with the background service restrictions in API 26 this may be a better alternative to services altogether. To use JobScheduler, you need to register jobs and specify their requirements for network and timing. The system schedules jobs for execution at appropriate times.